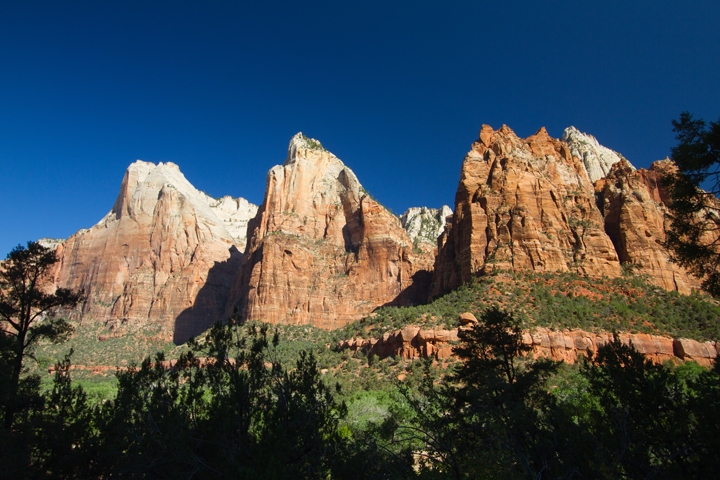 For our second full day in Utah’s Zion National Park, we did a hop on/hop off bus tour. Since they are free and run about every 7-10 minutes most of the day, Zion National Park’s shuttle buses are a fun and easy way to see a lot of different areas of the park. It was also extremely hot, so it was nice to be able to go between parts of the park on the shuttle instead of walking everywhere. They’re not air-conditioned or anything, but the open windows create a cooling breeze and you can sit and rest while you marvel at the views. Erin wanted to photograph the Court of the Patriarchs with the morning sun on them, and lucky for us, the sun has to get up over the canyon walls, so that wasn’t crack-of-dawn early! We started out at about 8:30 and took the park shuttle up to the stop. Court of the Patriarchs is a beautiful spot, and there’s a lookout up a very short trail that gives a great view. There’s a bench up there, too. The morning light was perfect on the hills! A wide-angle lens came in very handy – the vistas are so wide! The Patriarchs were named in 1916 by a Methodist minister for three of the big names in the Bible – Abraham on the left, Isaac in the middle and Jacob on the right. We spent just about fifteen minutes here – there’s not lot to do at this spot, but we were glad to have had the chance to really sit back and look. Then we hopped back on the shuttle and went up to the Big Bend stop due to a bird nerd alert. We had heard that California Condors sometimes fly up in that part of the canyon, and as they are one of the world’s most endangered species, we were hoping to see one (or even two – they have a nesting pair). This, too, is a beautiful spot. We saw hikers up at Angel’s Landing moving across the ridge, and we saw huge birds flying up in the canyon. We were sure they were the Condors, and we got pretty excited. And then we took out our iBird Pro app and realized they were probably Turkey Vultures. But maybe not. We’d look through our binoculars and then at the photos on our app. Binoculars, app. And repeat. We wanted them to be Condors! Alas, they were not. So we’re still in search of the mighty Condors! We did see a Black-headed Grosbeak there which we’d never seen before, so that was still exciting. And we saw and heard lots of Yellow Warblers which are prevalent in this park and have a beautiful song. Our next stop was the Emerald Pools Trail which leaves from the lodge. We did spend a few minutes watching (read: trying to identify) Western Bluebirds flitting about before our hike. Such a pretty blue! The Emerald Pools Trail is not very long (just 1.2 miles to the lower pool), and since it’s also near the lodge, it’s quite busy. If you go at noon like we did, it’s also very hot. (We wouldn’t recommend going at noon if you’ve got a choice!) The best thing about the Emerald Pools hike is that there are waterfalls at the end! Visitors aren’t allowed in the pools, so the cooling splashes from the waterfalls were a delightful surprise! After a big rain I’m sure they are rushing, and later in summer they may dry up, but for our hike, they were just perfect. We continued the “water is cooling” theme the rest of the afternoon. We stopped at the Weeping Wall, where the water actually seeps out through the rock. This trail is steep but just about a five-minute hike up, and it’s quite amazing how much cooler it is just getting close to the rock. Lots of green here, too, of course. Actually, we were surprised by the amount of green throughout Zion. We had expected more of an arid, desert landscape, but there are lots of deciduous trees here – particularly cottonwoods. Thankfully they weren’t blooming while we were there as they’re Jeff’s biggest allergy enemy! Our last stop was at Canyon Junction to go play in the river. There are some great spots easily accessible from the shuttle stop to wade or even swim if you want, and it feels heavenly at the end of a hot day. We had planned just to stay a half hour or so, and we stayed a lot longer than that because it was just so beautiful, relaxing, and cool! It’s a pretty popular spot in the afternoon. 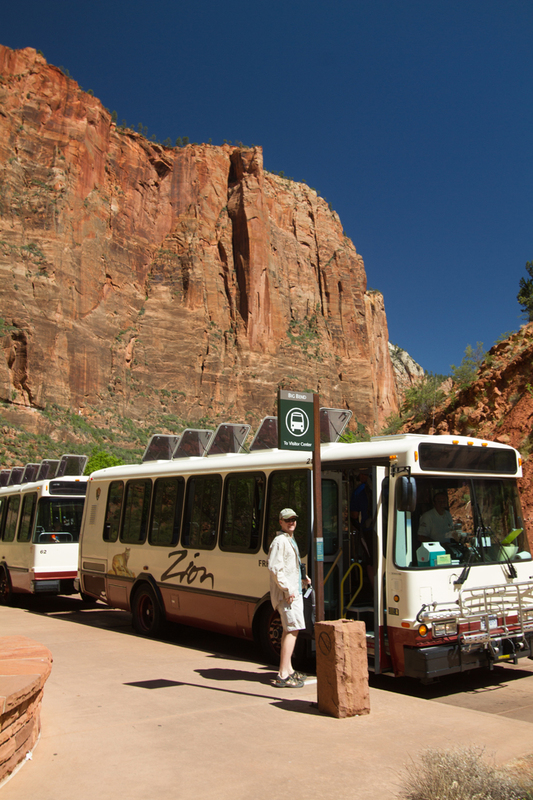 If you only have one day in Zion and you’re not up for the Virgin River hike, the hop on/hop off shuttle bus is a great way to see several areas in the canyon. You might want to finish at the Riverside Walk if you’re not doing the river hike instead of the canyon, though, because that’s a nice little walk and you can also play in the river there. 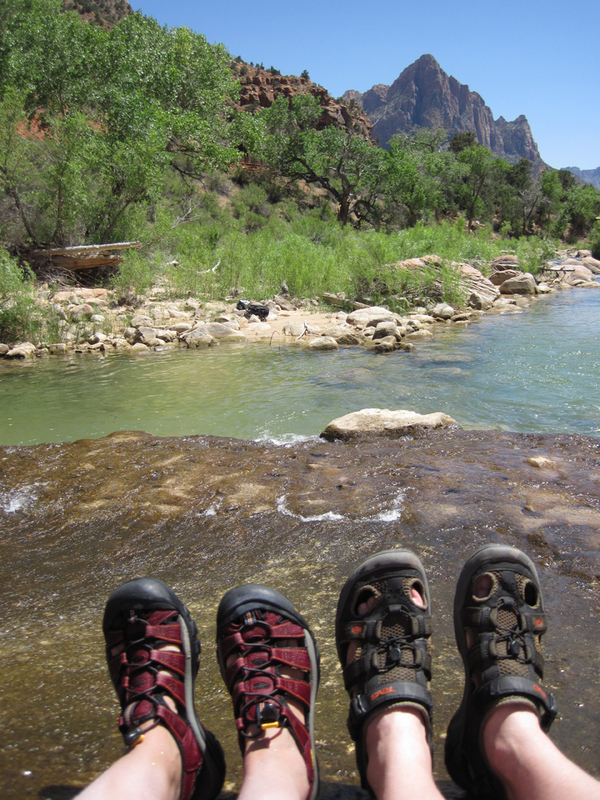 Do you have a favorite spot in Zion we didn’t mention? Leave us a note in the comments, and enjoy your next national park adventure, whether it’s for a week or a weekend! I can’t wait to go to Zion National Park. My husband and I will be going there when we go on our Great American Road Trip. Looks like you had a great time. Glad to learn about the shuttles. The shuttles are awesome. Can’t wait to hear about your road trip!